NEW COM.IND.USA. 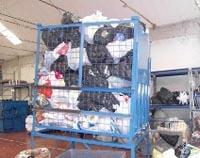 SRL, Облекло - внос-износ, recycled clothing, second-hand clothes, в EUROPAGES. Comindusa srl has track record in the clothing and footwear sectors that stretches back for over 25 years, and its business consists of sorting and selling clothes and shoes. Most of our clothes is sourced from collections made in Switzerland. We supply a wide range of package sizes: sewn bales, plastic sacks, 300 kg packages and smaller packages weighing 45 to 50 kg. Experienced staff, we are a byword for quality, reliability, precision and professionalism in all aspects and for all the merchandise we offer.